US company Halliburton will plead guilty to destroying evidence relating to the 2010 Gulf Of Mexico oil spill. The plea agreement, which is subject to court approval, means Halliburton will have to pay the maximum possible fine. The spill occurred at BP’s Macondo well in the Gulf of Mexico and was the worst in US history. Halliburton is the third of three major companies at the heart of the oil spill to admit criminal wrongdoing. Oil giant BP and rig operator Transocean have already pleaded guilty to charges related to the disaster. The US Department of Justice said that prior to the blowout at the rig, Halliburton had recommended to BP that the Macondo well contain 21 centralizers – metal collars that can improve cementing. However, BP chose to use only six. The justice department said that Halliburton had run two computer simulations of the Macondo well’s final cementing job to compare the impact of using six versus 21 centralizers. It said the results of these simulations indicated that there was little difference. The department said that Halliburton’s programme manager “was directed to, and did, destroy these results”. “Efforts to forensically recover the original destroyed Displace 3D computer simulations during ensuing civil litigation and federal criminal investigation by the Deepwater Horizon Task Force were unsuccessful,” it added. Halliburton, along with other firms, is also facing a civil trial over the oil spill. 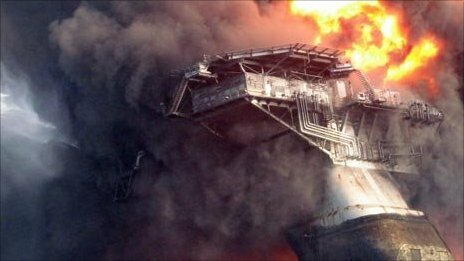 It is expected to be one of the biggest and costliest trials in decades and will determine the causes of the spill, and assign responsibility to the parties involved, including Halliburton, BP, Transocean, and Cameron, which manufactured the blowout preventer meant to stop oil leaks. In April, Halliburton said that it was in talks to settle claims in the trial. However, some observers said the guilty plea by Halliburton may indicate a weakness in its position in negotiating a settlement. “Their willingness to plead to this may also indicate that they’d like to settle up with the federal government on the civil penalties,” said Edward Sherman, a law professor at Tulane University. Halliburton has already made a voluntary contribution of $55m (£36m) to the National Fish and Wildlife Foundation. For its part, BP put aside $7.8bn when it agreed last year to pay compensation for the oil spill.